Just to say thank you UK Pianos for the new piano. Your sales team were really helpful when I ordered it and it was delivered and assembled on time and very professionally. Following on from the excellent research that Graham Howard provided and following some Email discussion with Graham, I ended up purchasing the Yamaha NU1 Hybrid Piano. This piano is absolutely lovely and I am totally in love with it. What is a hybrid Piano you ask? Well, this Piano has the internal action of a Yamaha Upright piano, but it doesn’t contain any strings, but instead uses samples from Yamaha’s top Grand Piano which is challenging Steinway for their crown. The Piano looks absolutely amazing. 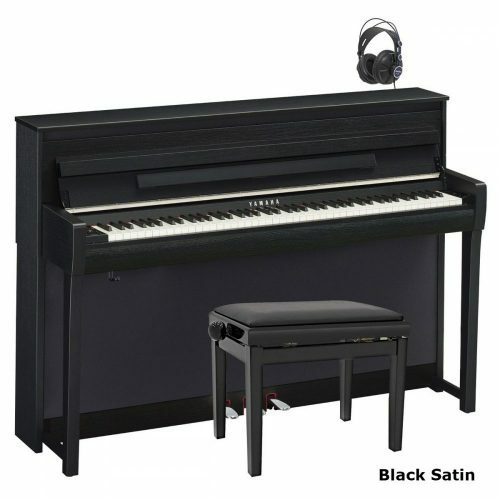 It has a black polished ebony finish and looks to all intents and purposes like an acoustic piano. The only real difference being the height (it is not as tall) and the weight (it is much lighter). There is a very small subtle control panel on the left of the keyboard and an on/off switch on the right of the keyboard. One closer inspection, you notice the discrete speakers although I didn’t even spot these until they were pointed out to me. The NU1 looks the part and would be a desirable piece of furtniture in any room. It also has all the other little features that shout out quality such as a slow descend lid and three very shiny and authentically behaving silver pedals. So, what does it sound like? Well it sounds like the piano that it samples. The samples have all been taken individually from several different parts of the sampled Grand Piano. The samples with pedals are also taken seperately which gives a very real feel to the sound. The internal speakers are excellent and it sounds amazing both when playing it and when listening from a distance. The feel of the piano was the main reason I purchased it though. I have lessons on a decent Grand Piano and am at a level now (just sat Grade 5) where my old digital piano was teaching me bad technique. Well, the Yamaha NU1 is a delight to play and has the feel of an acoustic piano. The keys feel the same. You can do things (such as trills) in the same way as you would on a real acoustic and there is not a big transition when you move from this to an acoustic. With my old DP, I was finding that the techniques I used on one would not transfer to the other and vice versa. I don’t get this at all. It is a joy to play. So, why did I buy a hybrid? Well, it sounds much better than any comparable priced upright I could buy. Plus it doesn’t require tuning and has two headphone sockets meaning that you can play at any time of the day or night and a friend can listen in too. What else might you want to know? There are five voicings. 2 x Grand Piano, 2 x Electric Piano & 1 x Harpsichord. Not many, but sufficient for what I realistically need. It allows you to record what you are playing to the internal memory or to a USB stick and supports MIDI should you want to export stuff and add different sounds. It also comes with the music for 50 classical songs in a Yamaha book and these songs are built into the piano, so you can hear how they should sound, trick your friends into thinking you are a maestro or just listen to for relaxation or to learn from. This all sounds a bit positive, what are the bad points? Well, to be honest, I don’t have much negative to say about it. The polished black finish shows up fingerprints quite easily, so I spend more time polishing it than I did the previous one. However, I also spend more time playing it. I just want to sit down and play! The voices are limited, but to be honest, when I had 600 voices, I only really used a few piano and electric piano sounds. I miss the pad sounds, but you can use MIDI for things like this. Besides, the acoustic pianos only have one sound, so I’m already up on the deal. You don’t get the exact same feel through your fingers as with a genuine acoustic, but it is close enough and feels a lot nicer to my fingers if anything. In summary, this piano is amazing. There are other piano’s in the Avant Grande range that maybe feel more authentic, but they sample the older Yamaha Grand and cost double the price, so aren’t really an option. I love this piano. My friends love this piano. It has a real “live” sound. It feels like you are interecting with a “real” instrument. I have also recently played a Yamaha upright and I didn’t think it quite sounded or felt as nice to play. GO BUY THIS PIANO! You won’t regret it. My choice was made basically because of combination of it’s amazing closeness to an acoustic when playing (in my amateur view) and also the lovely piano sound and the relative simplicity in terms of knobs and functions – with the volume control and the record features being the ones I most wanted. I love the piano with one reservation – the mechanical sound of hitting the keys is really loud and can sound almost like knocking on a door and makes me wonder if the neighbours can hear that through the wall. And also it means that the volume needs to be higher when practising (than on the Broadway) which slightly defeats the object of volume control. Still quieter than an acoustic of course and I am not disappointed but I have had to get used to this. I mentioned it to the shop and queried whether the piano was set up right, so played it on silent over the phone to the guy in the shop. He said it was a normal sound but admitted it was louder than with the silent acoustic models. I have suggested he mention it to Yamaha and that this should be addressed in their next model design. I think your service and advice is amazing – sorry I didn’t buy from you but had to trade in 2 pianos to make the purchase. I’d like to thank you for the piano buyers guide I downloaded, it came in very handy for my purchase which was between the Yamaha CLP 470PE and the Yamaha CVP 601PE. I finally decided on the Yamaha CVP 605PE after going to a shop in morecambe, where I live. The salesman wasn’t pushy or trying to direct my attention to any specific piano, which was what I was expecting and he demonstrated for me and my husband most of the stock in the showroom. The CVP 605 is very easy to use and I’m having lots of fun at the moment figuring out what does what, etc. The keys have the graded hammer action which you can adjust to your personal feel which is a great feature to have if you come from a light touch keyboard as I do, I have found the standard setting a little hard on my fingers, there are 5 settings to chose from and are easy to adjust on the touch screen. The guide function/performance assist feature is very good as you can follow the score on screen with its bouncing ball and lights above the keys. I would definately recommend this piano it has so much to offer especially if you use an Ipad for your scores and songs and it comes with a usb mini wifi adapter which plugs in underneath the piano so no messy cables. It also comes with a music book, manual (which I would recommend reading) and a bench. I love this piano, it sounds awesome and looks great and feels to me like the real thing. We have bought a Yamaha CVP-605PE last weekend at Music Electronics in Lokeren Belgium, so far excellent service. It will probably be delivered next weekend (it should have been today). I don’t know where the European Yamaha main stores are, not in Belgium as far as I know. Our son wanted a keyboard from the beginning instead of a piano but we told him he had to follow piano lessons for the correct touch, etc,… so he did. Now he comes back to us by saying he would like to have both combined, therefore we chose the CVP-605. We have seen the instrument in different shops as well as on the internet: it looks like a terrific and very stimulating instrument. We would like him to be extra motivated to persevere in his playing and we thought that this Clavinova would fulfil all his musical curiosities (with only a real classical piano, we were almost sure that he was going to stop, although he likes to play). I am curious if our prognosis will be correct. The yamaha cvp 605 has a great sound and the touch and feel is like a real piano. It is just like you said in your e-book. I chose this piano because I wanted a great pianosound and touch. I first had my mind set on the clp 470 but in the store I tried them both and that made me choose the cvp 605. There is a huge difference in price but the price is usually the first thing you forget when you are happy with your choice. I was also very happy I read your book, that really made my choice easier and it also made me ask the right questions in the music store. Thank you for that. I first visited your Enfield premises with my 18yr old grand-daughter. As with other reviewers I appreciated your unbiased help and opinions before allowing us the unaccompanied freedom of your ground and first floor pianos displayed which my grand-daughter enjoyed sampling. On giving you my order the next time I visited, for the Yamaha model cvp605 I had settled on I updated the free stool included to a double/storage one. In subsequent days your colleague Afsana kept me informed of the delivery date and later confirmed my requested delivery hour. Yesterday (Saturday 8th. March, 2014) I was at the delivery address when the very friendly Neil & Steve arrived promptly in the hour arranged with the ordered piano. with them and I am sure you will be pleased to know they could not have been more helpful. under your five years guarantee, my grand-daughter will receive the same impeccable service given to me. I bought the Yamaha CVP-609. I bought it mainly because I love the piano sounds on it and the touch. It plays beautifully, even though I don’t! Lol. It’s so responsive. It’s got other great features too, as you may know. Thank-you for your purchase guide. I’d prefer not to do a review as I’m useless at writing but I will say that I’d give the piano sounds, with all the nuances that can be achieved with and without pedals, and the keyboard response or has a score of 10 out of 10. My Clavinova was delivered this morning and I was very impressed with your piano moving team for their efficiency and clear information relating to delivery timings. So far, I am delighted and especially with the information you gave me on the telephone, answering all my questions prior to my order and delivering a very good package with the included accessories. I appreciate your knowledgeable and excellent advice that confirmed this purchase was suitable for my needs. I came across Graham Howard’s steps to choose my new digital electric piano. ease of use and enjoyment. I am truly grateful for the guidance given by Graham to choose this magnificent instrument. My life has new meaning with my new piano! I found the Yamaha P35 is just right for me (so is the price). I HAVE BOUGHT A YAMAHA P35 DIGITAL PIANO I AM HAPPY WITH THE TOUCH AND FEEL OF THE KEYBOARD IT WAS YOUR RECOMMENDATION AS THE BEST PIANO IN MY PRICE RANGE IT ALSO SEEMS WELL MADE AND THE SAMPLES SEEM PRETTY REALISTIC I WOULD LIKE TO THANK YOU FOR YOUR HELP AND ASSISTANCE IN MY CHOICE OF PIANO. I bought a Yamaha P35B last week. My aim was for something that felt and played like a piano, and at age 70, I did not think it fair to dig into our savings too much. I was actually hoping to try some out and did not intend to purchase that day. However I was very taken with the P35B, and with stand the price was $A620 down from RRP $A699. I am thrilled and very pleased with it, though I got a bit of a shock when I searched under for the serial number to register my purchase, and saw “Made in China”. I am playing some simple pieces from the music already. I’m an adult learning piano for the first time and had a limited budget. I found Graham Howard’s advice and information, particularly through his website, extremely helpful in making my choice. I bought a Yamaha P35 portable piano. UKpianos customer service was also excellent, I was able to choose a convenient delivery date and everything went smoothly. The piano sounds and feels great and was just what I was looking for, I am very happy with my purchase. Also, I purchased Hejran’s Piano Method Book 1 through you and am finding it very helpful in my learning. Thanks to Graham’s information we were able to purchase a piano we were happy to begin learning on. My wife and I are both beginners and were initially looking for an acoustic piano but quickly decided that a digital piano would be more suitable. 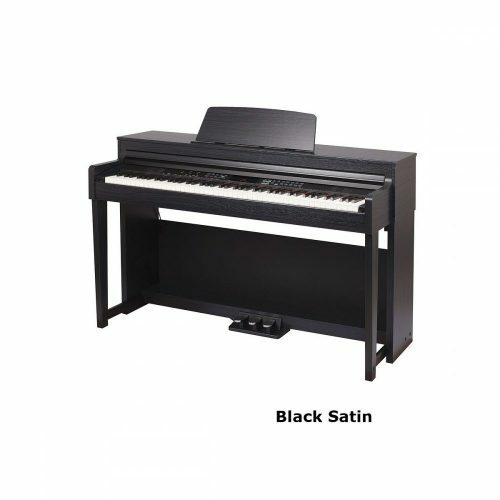 We initially looked at a large number of pianos in the 1-2 thousand dollar range. This list included the following from Yamaha: the low end Clavinovas, Arius models, DGX-630, as well as a couple of the pro line like the CP33 and CP300. Other models we checked out included Roland’s FP series and a few models from Korg & Casio. Once we had narrowed the field we came to the conclusion that the P155 was the best match for us. The keyboard feels very much like an acoustic piano and we both really like the sound, especially through high-quality headphones or patched through the stereo. The sound of the built-in speakers is good at moderate volumes but suffers a bit in the bass end, which is to be expected given the size. While the piano has a relatively small number of voices and is lean on non-piano features it really does excel as a compact great sounding piano — the more we use it the more it seems like a “real” piano. There are a few things that could be better. RCA jacks would be the more common method to connect to home audio equipment and the existing 1/4 inch jacks do not automatically disconnect the internal speakers (a dummy plug in a headphone jack is required for that). There is a usb connection but it’s only for external memory and won’t connect to a computer: a separate midi adapter is required for that. We skipped the Yamaha stand as it seemed over-priced. On the plus side we thought the keybed feel was very good and both of us really like the grand piano voice sound. It’s a joy to learn on. Thanks for the info on this site as it helped with the decision quite a bit….. I purchased a brand new Yamaha P155 keyboard 3 days ago and absolutely LOVE it. The information in your article was very helpful, and enabled me to focus in on what features were most important to me. I took piano lessons as a teenager and am going back to them now as an adult in my 50’s. I have had a Yamaha PSR 2000 keyboard for quite a few years (61 keys, all the bells and whistles). I wanted to purchase something with a true piano keyboard (88 keys, fully weighted). Digital pianos seemed to be a good fit for my needs – the feel of an acoustic piano, a headphone jack (which would enable me to practice any time of day without disturbing anyone else), and the ability to record / upload / download music files via MIDI (USB) connection. I looked at Yamaha, Roland and Kawai keyboards and digital pianos. Initially, my biggest challenge was trying to determine whether I wanted a piece of furniture (something like the Clavinova or Yamaha Arius) or a keyboard on a stand. Keyboard quality (weighted keys, touch sensitivity) and price were the 2 main factors affecting my choice. I also wanted a USB port (not just the MIDI in/out) if at all possible. After trying every product available, I came to the conclusion that, based on my playing ability, any one of the products would more than meet my needs (both now and in the future). In the store, there is always ‘something a bit better’. Although the fully loaded products were very tempting, I decided that I didn’t need all the bells and whistles (300 voices, rhythms). My PSR 2000 has all that and I find I use very few of the extra functions. I also decided that buying a keyboard with the fully weighted keys would meet my needs and keep the price point within my budget. The Yamaha P155 offered a cost-effective solution. Initially I was a bit disappointed with the quality of sound when I set the keyboard up at home. My husband hooked the keyboard up to some Yamaha speakers and a subwoofer. What an improvement! The keyboard is very easy to use – very few buttons, intuitive interface, easy to navigate. I’ve already downloaded files to a memory stick and loaded them into the keyboard via the P155’s USB port. The USB port is located at the back of the keyboard (rear panel), which is not particularly convenient. The solution: A D-Link USB adapter sitting on top of my keyboard, within easy reach. The adapter plugs into the keyboard’s USB port and the memory stick plugs into the D-link adapter, which is easily accessible. Right now, I have the keyboard on a portable X stand. It’s reasonably sturdy, but I do plan to get a stronger / more permanent stand for it. I’ve only had the keyboard for 3 days, and will be starting my piano lessons next week. Can’t wait! good feel for the piano. hours sitting behind it enjoying my new purchase. and took delivery on Tuesday this week. (heavier than the Roland FP4 and infinitely superior to the Kawai ES6). The touch response was great allowing for a great deal of expressiveness. speakers had been so poor. They were rich at the bottom and crisp at the top. wooden/chipboard stand (L140) which it fixes securely to using four screws. We bought this, £98, so that it does look like a solid piece of furniture. acoustic effect as if you are playing in a hall, on stage or in a room. adequate to make listening painful if turned up to full volume. further speakers if you so wished. memory of the piano as well as through the USB. turn off the left or right hand part to play that part of the song yourself. Many thanks for such wonderful advice ukpianos! to buy a faux-wood stand at a later date. included lessons as a starting point. has performed well in our home. Before the demo of the Yamaha P155 we were inclined towards the Yamaha CP33 but when we compared the two side by side we realised the P155 was the better of the two (for us anyway). Your guide was really useful, during the comparison. The P155 was more weighted and seemed to have a more expressive feel. It passed your ‘touch sensitive test’. We then found another shop (music room) that had the P155 and compared it against other DP’s. We discovered some that were better, but they were not stage pianos, which is what we are looking for and they were more expensive. In particular, we found the Yamaha Clarinovas were very good indeed. This shop also had our existing DP and we realised the P155 was a significant improvement. We are collecting our P155 tomorrow along with a Roland KC-150 amp. Of all the advice you gave I think the best was to try (armed with the information in your guide) before you buy. Without it, we would have ordered the CP33, which I am sure is a good piano but not not for us. I went with this particular model due to not having space for a furniture style DP and, as I will eventually be using the piano to key into my PC, I am able to place the P155 directly in front of my PC. In fact, at the moment the piano is a semi permanent fixture in front of my PC [which is also my TV] so I can practice scales and arpeggios on it fairly constantly. Additionally, the P155 has stereo line outs which the less expensive models such as the Yamaha P85 and Casio PX130 did not have. I have also found that the 12 watts per channel speaker output really is the minimum for ample sound depth [as your booklet stated], so I am glad I did not purchase a model with only 6 watts or so per channel speaker output. I am only a beginning piano ‘student’ – I first had lessons around 30 years ago but stopped as the lessons competed with my classical guitar studies at the time. So, it is nice to have a reasonably decent piano keyboard to practice on – so much better than my old up-right piano which weighed an absolute ton and took up nearly as much floor area as a small bed. The best thing about the DP is that it is tune and at concert pitch – something that my old real piano was never able to be tuned to due to its age and lack of playing to get up to pitch. I can’t say how much more enjoyable it is to play a piano that is in tune with other instruments, however virtual they may be! Your piano booklet was very handy in helping me make my decision, particularly with the key weight and the overall ratings you gave the Yamaha DPs. Thanks for the very useful information you provided. for more sound quality I wanted to get an amp for the digital piano. 1. It looks like a professional piano. That’s important for me. This is not a toy, it is a professional looking instrument. 2. The earphone inputs are at the front left end of the piano and are easily accessible. They function properly. 3. It has a USB port for a flash drive in the right rear of the piano and you can record your music to it. 4, It connects to a midi interface through two midi ports located at the read of the piano. Not a problem for me. 5. The sound of the piano is just as if you were playing a regular acoustic grand piano. I’m very impressed with the sound. 6. I’m not too sold on the strings because I have heard better sounds from my the Steinberg Symphonic Orchestra. They do a much better job of emulating the sounds of violins and violas etc. 7. You can control the touch of the keys. It has three levels: hard, medium, and soft. 8. You can also control the type of ambience. Are you playing in a large hall, you can set it to that. Are you playing in a room, you can set it to that. 9. Twelve watt speakers on either side. What a difference a day makes. No need to plug into an amplifier, especially as anyone who buys this piano will want to play it at home. 10. It is heavy. Not for the weak and squeamish. It is worth the price and the trouble I had lugging it up a flight of stairs. Once in place, I know I don’t need any other piano. I’m also glad I didn’t buy the Yamaha DGX 640. That would have been a big mistake. The keys on the P155S make no appreciable sound when you play on them. 11. The base of the Music Rest which comes with it has a metal base and the stand itself is made of hard plastic. Just beautiful. 12. It comes with a great sustain pedal also which responds well to use. 13. Two types of grand pianos, two electric pianos, a jazz organ, a church organ, and strings and other. You can even split the piano and have it play a different instrument on each part, as I can do with my Roland XP10 synthesizer which I will definitely not give up to anyone. I’m upgrading from an M-Audio Pro Key Sono 88. The only reason I’m upgrading is that I have to use an amplifier to use it as a stand alone piano. This new P155S is the type of piano you can leave out and practice on anytime you want to without hooking up wires to it. I think that’s wonderful. It has some demo songs that seem to have been played by a 5 year old child. I don’t care about that. I can do better. In short, the Yamaha P155S is a piano player’s dream come true. It is everything it promised to be and more. I will be playing it until the day I die. I am very satisfied with my new Yamaha P155 digital piano. is a nice solid keyboard and to my ear sounds fantastic. which is good as I am starting to use that more in my lessons now too. carry it around often though. It is quite expensive but at the same time it does feel like a good quality instrument. I’ve only had it a week but I’m very pleased with it. I’d give it 8.5/10 overall. I researched online for different brands/models/reviews and I eyed the P-155 amongst others as a potential option. I needed something that I would keep for a while and I was looking at a few other choices. It’s a struggle to look up information to get a good sense of what you want/need. After finally going through your written material, it gave me the necessary push to go ahead and purchase the Yamaha P-155 keyboard. This seemed like an excellent keyboard for someone who’s learning and to keep my focus maintained on technique and sounds of the actual piano rather than diverting my attention to potential DJ skills. The feel of this keyboard is great, the sound is nice and crisp, with a good set of adjustable variations. I bought the Yamaha P155. I was considering also the yamaha P90, but the feeling of the keys was a bit better on the p155. I am a double bassist starting with piano, so no expertise on this. Sound is ok if you are not expecting the real thing. With headphones is good. I enjoy playing it a lot. I purchased a Yamaha P155 – which was the best for me in my price-range. I love the sound quality, especially in the higher octaves and the sturdy, smooth feel of the keys. It is an absolute joy to play. 1. Good main piano sound. 2. Touch is comforting. Responsive but well weighted. Feels a little bit mechanical the action however, but this is a £870 electric piano not a Steinway. 1. limited sound options. only 25 sounds overall. 2. no decent recording facility and storage. 3. Not directly USB linkable, there is midi of course. Having already made the mistake of previously buying a keyboard that did not suit my needs, I started to trawl the internet for digital pianos, only to become even more confused and bogged down in a sea of techno-jargon. This is until I stumbled accross the ‘Howard Score-Digital Piano Rating System’ which made it all much clearer and, most importantly, explained to me what I was actually looking for and which models had these particular attributes. With some further help from Graham I have now found exactly what I wanted which was a stage piano that behaves exactly like the real thing. 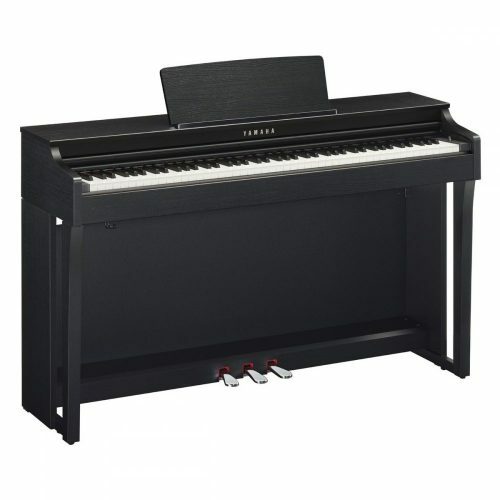 Thanks to the invaluable information in your very comprehensive article, ‘Howard Score-Digital Piano Rating System’ – http://www.ukpianos.co.uk/the-howard-score.html – and also in your ‘7 Things You MUST Know Before You Buy A Digital Piano’, I’ve been too busy enjoying the Yamaha P-155 I bought online. As for the Yamaha P-155 – it’s a joy to be able to turn it on and play. I’m really into piano noodling – experimenting with chord voicings and progressions – and when ideas suddenly appear from out of the blue, it’s easy – switch on, and the P-155 is always ready to go. And in the quiet of my small music room the speakers at just below half volume are fine for what I want. For me, GRAND PIANO 1 is the main instrument, and it was a digital piano that I wanted – with TOUCH set to medium and BRILLIANCE to mellow, I find it well satisfying to play – and as already mentioned, the sound quality in the upper octaves is especially sweet – perfect for Debussy and Satie. Once again, Graham, thanks for all the piano information. I couldn’t have done it without your help. normal piano the force needed to get sound makes me adjust and slide off the wrong key. only a selling point for experts. alternative function for this one. The mixer is good to have (between layers). than extra sound tweaks, built in recorder, or loads of sound. Ipad one day and try this out. is a big plus on this model as I don’t want tech-stuff be in the way formy creativity. Lovely piano sounds and realistic piano action. Other quite usable sounds also. Great price and feel of quality. The Grand piano sound on its own is worth the money for me. I am no genius player or expert on stage pianos but for me this has been a very successful purchase at a price far lower than I was originally expecting to have to pay. It may not be as new and have as many features as say a CP50 (which I was originally thinking of buying) but for me the CP33 should be fine for years to come (and its£500+ cheaper). Nice headphones really bring out the quality sound too (I bought some studio ones for£85 which sound amazing). It also came with a decent stand & pedal and cubase software. I recommend. about it, because of the enthusiasm of a new purchase.. Awesome piano sound, very warm and harmonic and realistic. Latinpiano is great, also the Rockpiano is awesome. So it is very versatile. and realistic. Lots of usable and good quality FX and Synths and presets. Far beyond what I expected. the annoying constantly displayed ´120´ on a P80 or P155 it is heaven. bit more easy but still keeps the piano feel. nice.. but adds nothing to the sound or feel. should be perfect, but they are short sampled rubish. much better in that respect. Electric Piano sounds and add a second Grandpiano instead. choose from made by CP owners soon. would like to know more about it. Also recording volume is not adjustable. more clear when tones fade away and has only normal, expectable noise. other tracks made with this usb device. Using the CP-50’s features are not always logic and the Yamaha manual offcourse is terrible. Getting the sound you want and then storing it is a bit difficult for instance. The CP5 is a bit more easy on that matter I asume. between two keys and the knobs are a bit out of place. like it, but I do. People really think I have a real piano inside when I play some tunes on it. They have their own repair shop and they custom build some DP’s. surface, only 50 euro extra. Really beautifull. The main reason I chose the CP50 was because of the weight (only 20kg), it is very good quality for what you pay for, feels solid and has a very good keyboard action and is graded hammer. It also has newer Yamaha sound technology allowing you to customise the piano sounds more; even though there is only one piano voice, you can do so much with that one voice with all the options you can get. I went on the internet and looked for some digital pianos and came across your guide. It shifted my focus on the Clavinova series. Based on looks I liked the CLP S 308PE. It has a modern appearance and as I understood the NW GH3 action. However it is clearly not portable. So I still had some doubts. I went to the biggest Yamaha shop in Bangkok where they have nearly the complete Yamaha program. So I spent hours and hours comparing pianos (including the acoustic U1 piano). Some pianos like the modus series are very impressive but insanely expensive. However they do not have speakers inbuild so comparing was tricky. So up to this point I was getting closer to buying the CLP S 308PE. 2 things made me hesitant: price and lack of portability. Last Tuesday I decided to make a decision. I went back to the shop and this time I used headphones to check the CP1 an CP5. And I instantly knew that the CP5 is the answer to my dilemma. The keys feel very ‘real’ and the piano sounds are lightyears ahead of the P95. I dare to say that the electronics of the CP5 and the Clavinova are identical or similar. So the sound the pianos produce is ultimately defined by the speakers. I plan to use my hifi stereo system anyway at home so I decided not to trust the comparison between the sounds generated by the Clavinova’s wooden body and a pair of headphones. – key action -> on paper the Clavinova wins as it has ‘graded hammer action’ which the CP5 does not have but the CP5s wooden weighted keys feel just great to me. I have tried real acoustic pianos (Heinrich, Yamaha) and there is a similarity there which is very pleasing. So maybe it’s a close call here between both pianos and as I said the Clavinova wins on paper.  – price -> the CP5 is expensive but so is the Clavinova (substantially more so). In summary the CP5 won based on my view that the quality of both pianos is similar but the CP5 is cheaper and portable and so I bought it. – sound with my 250W high end stereo system is stunning (Dynaudio/Symphonic Line) but I use it with a two channel 70W Marantz / Yamaha set which is still great. – keyboard action makes me happy every time I play. I have spent more time on the internet and found that most people prefer the Roland 700NX over the CP5 but this is professionals talking about marginal differences (I believe at least). There is talk about Yamaha using inferior electronic components in the stage pianos over the Clavinovas and about the inferiority of the S6 piano sound (can be tweaked) but I fully believe that this is a lost fight. It’s a bit like comparing 24bit sampling of CDs over a traditional analog record. The analog processing will always win and so will the acoustic piano. I am confident that until the day I start looking for an acoustic piano I am happy with the CP5 – with all it is and with all it is not (an acoustic piano).